Learn how to evaluate and improve your civic website content strategy. 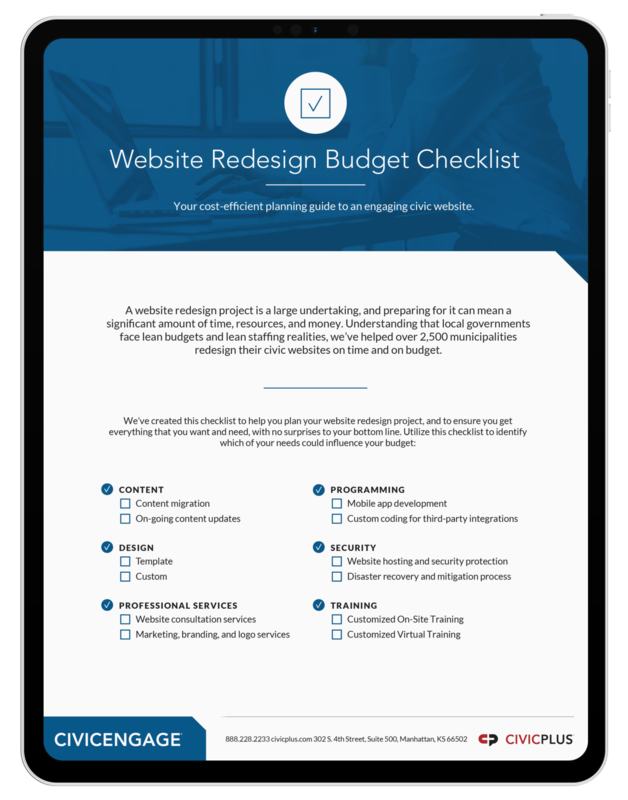 Everything you need for a successful civic website redesign, including a budget, project timeline, and security checklist. Today’s digitally-minded citizens are putting down newspapers and turning off cable, while picking-up smartphones and turning on tablets. When searching for local news, resources, and content, they’re searching for your municipal website. Consider what they see when your page loads—and be critical. At a time when YouTube is replacing cable viewership, and the average citizen has seven social media accounts, your website users’ expectations for engaging, valuable content has never been higher. Your local government website can no longer function as a municipal brochure, an organization chart, or staff directory—not if you want it to serve as a critical component of your citizen communication strategy. That’s because, when it comes to your local government website, content is king. Think your residents are only interested in engaging with dynamic content from social media platforms? Think again. Today, citizens of all tech-skill levels are expecting self-service functionality, video content, customizable subscription services, and more from both private and public sector entities that impact their daily lives. Why is Content Critical for Municipalities? It establishes your digital credibility. The more content you publish to your website, the better it will rank with search engines like Google. Content increases website visits. The best way to not only increase your total visitors but increase the frequency of their visits is to continually add content, which gives citizens a reason to keep returning. It sets a tone. No matter how many administrators are adding content to your website, all copy should be written in a way that reflects your community’s unique brand. Content enables transparency. Your citizens are going to expect to find transparency documents such as agendas and meeting minutes on your local government website. Depending on the laws of your state, not doing so may put you at risk of open data laws. Dynamic content produces impactful moments of interaction. Adding dynamic, visual content is just as valuable when it comes to creating an engaging civic experience. Click here to learn more about why when it comes to your civic website, content is king. 1. Is the information presented up-to-date? 2. Is the information presented something citizens are likely to search for on your website specifically (e.g., permit laws for your city), or would they be more likely to find it using a general search engine (e.g., home recycling tips)? 3. Is there sufficient municipal contact information provided and is it easy to locate? 4. Does page content exceed 2,000 characters? If yes, it’s too long—so start editing. 5. Does the formatting make sense? Should certain content be presented in a bulleted list, in a table, or have a topic heading added for better readability? 6. Are items housed where they need to live? If not, move them to the appropriate department or section of the website. For example, reserving a park pavilion should appear on your parks and recreation page. 7. Is your content intended for the public, or is the information intended for internal employees? Internal content should live in an intranet, not the Internet. 8. Does the information need to be housed on a page or would it be better served as a document (e.g., committee meeting agendas)? 9. Are included photos applicable to the page? Are they too small to be useful? Are all your images stock photos? Find ways to include fewer, higher quality, more relevant imagery. If your assessment of these nine questions has revealed that your current local government website design is in need of an upgrade, click below to download our Local Government Website Redesign Toolkit. It includes everything you need for a successful website redesign from security considerations to budget guidelines to an implementation timeline.